Back in the awesome days: Where's the beef? 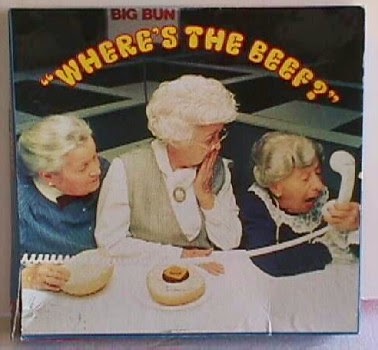 Hitting the airwaves on Jan. 10, 1984, "Where's the Beef?" was an instant sensation, spawning a series of Peller-starring sequels along with a raft of merchandise, from T-shirts to bumper stickers to Frisbees to a board game. Peller even recorded a "Where's the Beef?" novelty single with Nashville disc jockey Coyote McCloud. And three decades later, "Where's the Beef?" lives on as one of the most memorable TV commercials of all time. Ad Age named it one of the top 10 ad slogans of the 20th century, and it helped build Wendy's from an upstart fast-food joint into the third-largest burger chain in the world. Not bad for three little words from an 81-year-old manicurist.